Dramatic Photo Captures Rare Sight of 65-Foot-Tall Lava Dome in Hawaii « Adafruit Industries – Makers, hackers, artists, designers and engineers! With an incredible duration of 1,774 days, the Mauna Ulu eruption of Kilauea Volcano in Hawaii spread across five years. At the time, it was Kilauea’s longest running eruption and produced about 460 million cubic yards of lava. From 1969 to 1974, the astonishing eruption was readily viewable to the public via observation platforms, and produced some incredible natural phenomena rarely seen during these volcanic events. The US Geological Survey recently posted an image taken in 1969 by photographer J.B. Judd, which shows a rare dome fountain. Measuring about 65 feet (20 meters) high, the symmetrical dome fountain was one of twelve fountaining events that occurred during the first year of the eruption. 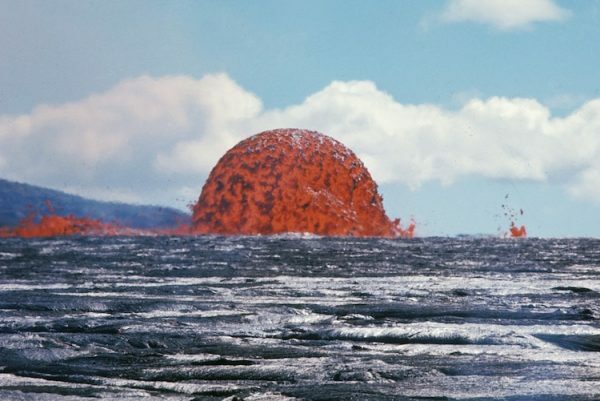 The outward spread of lava during the fountaining events was so heavy that it spilled into the ocean 7.5 miles away.